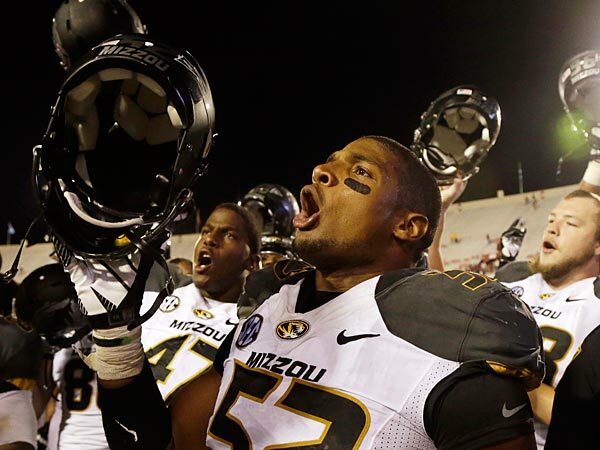 Michael Sam Announces He’s Gay, But What About the Draft? There have always been gay NFL and College Football players, only they didn’t come out while being active. Michael Sam, coming out of Missouri and being a highly regarded draft prospect changes all that with his announcement, which is interesting to look at not just from the social perspective of it when it comes to breaking down walls, but also how will it affect his draft stock. Sam was projected to be picked from round 3 to 7. He was a consensus All-American for the Tigers in his Senior year, winning the SEC defensive player of the year award. He can play both the defensive end and outside linebacker position, fitting well in the 4-3 or the 3-4. He had 11.5 sacks last season for Mizzou, and is appearing on most draft boards from all the teams in the league. But why now? One might argue that Sam didn’t choose the perfect timing to come out of the closet. Had he done it after the draft, he might have saved himself some money. NFL teams aren’t allowed to question players regarding their sexual orientation and on paper, the most important thing for all of them is to see what this player brings to the field, without caring about anything else. However, you never know what general manager thinks differently, and if this reaction might have a ripple effect on his draft stock, which pretty much means less guaranteed money on his rookie contract. But the perception is that if you’re good and you aren’t a problem in the dressing room or have behavioral issues off the field, you’ll find a place in the NFL. The Seattle Seahawks used 21 players who entered the league as undrafted free agents out of the 53 that won the Super Bowl. Sam might see his name being called up later than anyone expected it to originally, but if he’s good enough in the next few months in the combines and workouts, he’ll be playing in the NFL. Sam didn’t wait for his career to be over or hanging on the ropes to make his announcement. Some NFL scouts already knew about his sexual orientation, and according to Outsports.com, Sam’s orientation had been strongly rumored in the sports media over the past few weeks. NFL teams don’t like to feel a player is hiding something from them. Now, whenever anyone sits down with Sam and tries to feel what he’s all about, they’ll know for sure there’s nothing he’s hiding from them. Sam wants to succeed in the NFL, but he has bigger goals in mind. He puts himself at risk, or his career at least, for the chance to do something extraordinary, which is try and begin an NFL career by being an openly gay player, and not wait for it to end while hiding some part of himself from the rest of the world.